When it comes to hydraulic power unit set up or troubleshooting, the most important tool that you can have on hand but probably can’t buy locally is a good flow control / flow meter setup. 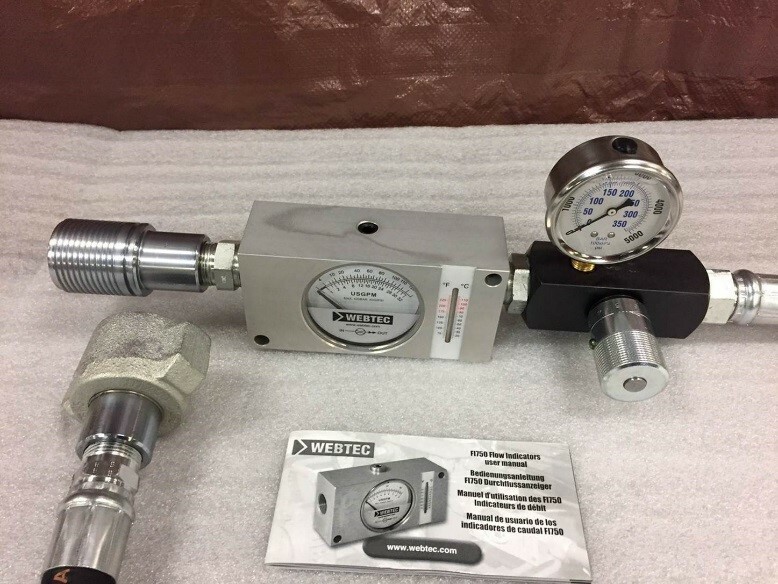 A flow control / meter will allow you to properly test the hydraulic flow of your hydraulic power unit, make adjustments to the hydraulic flow, and allow you to temporarily affect the hydraulic flow and pressure if you had hydraulic pumps or tools that you wanted to test in your shop. Without it you are only able to determine what pressure you are producing through the hydraulic pump coupled to the engine – not the gallons per minute of flow you are getting. This is especially important if you have a variable volume piston pump and want to make adjustments to the flow at a pressure that the HPU is delivering to your submersible pump / hydraulic tools. If you provide too much hydraulic flow to hydraulic motors on tools or pumps, you will most likely damage the motor. Pictured: Flow Meter Control for 1” connection 0-32 GPM 0-5000 PSI. 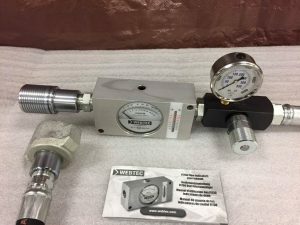 Pictured: Close up of 0-32 GPM Flow Gauge and 0-5000 PSI Gauge. Very basic but helpful, you can verify the max performance (how it is set up – flow and pressure at full throttle) of a power unit. In the rental world, this is especially important if you have received an HPU from another branch. If your unit has a hydraulic pump (variable volume piston pump) that allows adjustment, you can change hydraulic pump settings (how the HPU is set up for flow at a pressure) and have instant feedback on the changes that you are making. Some customer will buy a single power unit for two different pumps with two different hydraulic requirements and will change the set up on the HPU depending on which pump they need for the job. You are also able to use this device inline to adjust the flow up or down, or simply use it to see what affect changes in the throttle setting of the engine have. The flowmeter allows you to see changes in hydraulic flow (and pressure can be noted on the gauges) as you increase or decrease the throttle on any power unit. For example, the flow control would allow you to see what impact to the flow running an HT13G at half throttle would have. You can troubleshoot an HPU more effectively with this tool to determine that in addition to building pressure, your unit is providing hydraulic flow to the devices it is meant to power. One of the challenges we have when helping a customer to trouble shoot a problem with a system (pump and power unit) is verifying hydraulic flow (and as a result, hydraulic pump function). 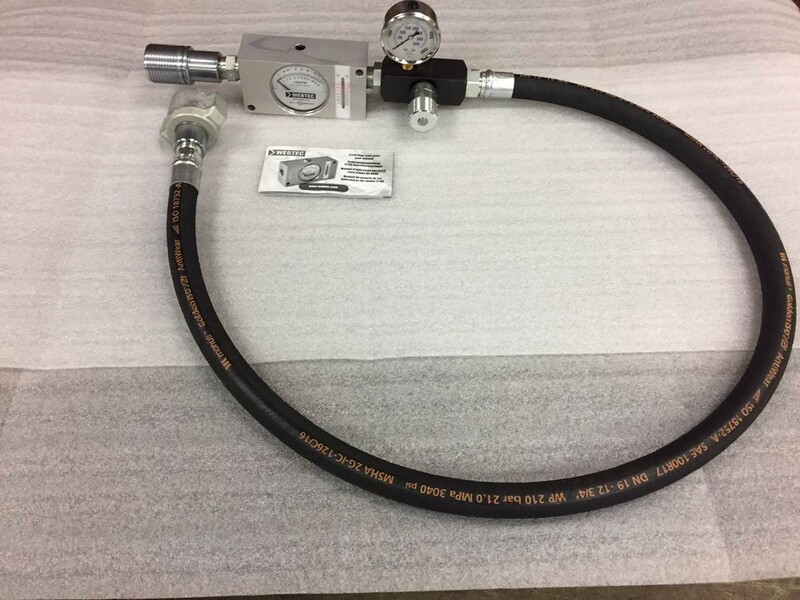 This device allows Hydra-Tech and our customer to verify that the HPU is producing hydraulic flow and isolate the problem with the device you are powering. Hydra-Tech pumps can put together a setup appropriate for the hydraulic power unit(s) you will be working with. Call today for more information, you will quickly find that when it comes to preventative maintenance as well as other tasks related to your HPU this will be the most valuable tool in your “hydraulic” tool box.